Provide your pontoon passengers with a Privacy Room while cruising the waterways on sale here at the best possible cheap discount online price. The waterproof Summerset Bimini Privacy room is a pontoon boat bathroom enclosure made of 100% marine grade polyester. It provides privacy while changing or using the porta-potty facilities on the boat. The versatile privacy partition is easily installed and mounted under a Bimini top or hard top and can be easily removed. 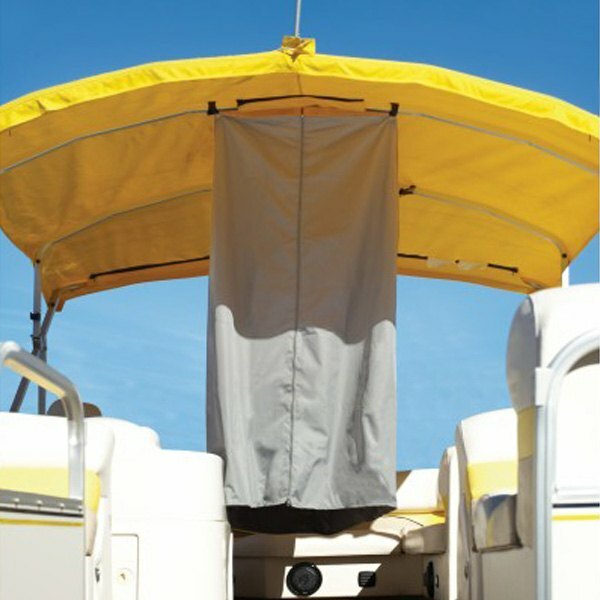 The Bimini privacy room is secured with UV resistant tie downs & fasteners anywhere under the Bimini top. The hardware and straps are included. The Bimini privacy room has a double sided full length zipper for easy floor to ceiling access into and out of the room that measures 30"L X 30" W and stands 70" high. At RV Covers Protects we are always looking for boating accessories that will make our customer’s marine activities more fun, convenient and accessible to as many people who enjoy life on the water. We pride ourselves on the excellent customer service and cheap discount prices on all our boating accessories. Our customers are always notified when their covers are on the UPS truck and sent the tracking information so that they know when to expect their Summerset Bimini Privacy Room. So the next time you have been out on the water for an extended period of time you will have the comfort of your own portable pontoon boat bathroom enclosure.